On Friday morning we headed for Littlehampton, a town not far from my grandparents house. My grandad has an orange Disabled thingy for his car, which allows him to park it apparently virtually anywhere, with the possible exception of the Buckingham Palace lawn on top of a Corgi. On this occasion he parked in a disabled spot behind the main street, and we nipped into the supermarket, a medium-sized one with one of those names that is almost instantly forgettable, like “Mega-Fresh” or “Quickshop” or “Super-Price” something like that. While Gran and Grandad looked at the potatoes, I had a quick look around, observing the differences from supermarkets at home. The most noticeable thing was the checkouts. English checkout staff (and the gender split was much more even than at home where most are female, so I’ll avoid the common Australian term checkout chicks) actually sit down while working! Not only that, but YOU, the humble customer, have to pack your own shopping bag! Talk about cushy. After the supermarket and a quick visit to the bank where Grandad wrote himself a cheque, an odd idea if ever there was one, we looked around Littlehampton’s main street, which was quite utterly charming, in a main-street-full-of-shops kind of a way. Then we returned to the car and drove on to a humungous Tescos supermarket just outside the town. This was the full monty, with a huge carpark and a coffee shop and petrol station built in. They also had, and this is pretty clever if you ask me, a variety of different shopping trolley options for different family configurations. Apart from your standard trolley for people without kids, they had baby trolleys, trolleys to carry two babies, trolleys for a baby and a toddler, for two toddlers, and lots of various permutations. They also had ones for single mothers, which had a special spot to store a Social Security cheque. Or quite possibly I just made that up. I hear they’re even thinking about introducing a model on which all four wheels work at once. I definitely made that up. After the obligatory cup of tea, to strengthen us for the massive shopping mission ahead, we stormed into the supermarket and bought two dozen packets of low fat yoghurt. “Last of the big spenders”, remarked my grandmother as we headed for the checkout. Next stop was Arundel, a town of historic streets and shops, and a bloody big castle on one side, which I had spotted from the train on the way down from London a few days before. In fact Lonely Planet describes the town as “a pleasant little tourist trap”, but while I was being a tourist, I generally like to think of myself as not being too susceptible to the usual lures conceived to help one part with one’s money just because something looks interesting in a cool or quaint kind of way. That doesn’t mean it’s true of course, but it’s how I like to think of myself. We parked the car in Arundel’s large, historic and picturesque carpark, and walked over to the castle. It was only about 10:30, and the castle wasn’t due to open until noon, so we looked around for alternative entertainment. We chose to have a bit of a walk around the town. The streets are tiny, and most of the shops looked interesting – at least from the outside. There seemed to be an endless supply of semi-antique shops, in that they gave the impression of selling antiques, but when you looked at what they were selling it wasn’t necessarily old. Even after taking the time to stock up on postcards, it was only about 11:15, so we headed down to the river Arun, and used a packet of old bread that Gran had thoughtfully brought along to help fatten up the local swan population. After all this activity, Gran and Grandad were a bit worn out, and decided to wait in the car while I looked around the castle, so I headed for the gate and the short queue to get in. At midday we all got let in through the rather impressive gate and started the climb up the hill towards the castle building itself. Walking across the drawbridge reminded me of that scene in The Holy Grail where Arthur and his mates are held at bay by those sneaky French k-nig-hts. But no cows got launched at me, and I went inside to explore. I was almost the first into the main building, and because I didn’t stand around in the first room gawping for too long, I got in front of the rest of the visitors slowly moving through the round-about course through the castle. This made it all the more pleasurable, as I didn’t have to hear other amazed voices exclaiming how quaint and well preserved it was. They didn’t allow people to take pictures inside the main castle building, although I can confess now from a safe distance that I did shoot a few seconds of wobbly video of a hallway while nobody was looking. Presumably they wanted to make sure you bought the guide book, which I had anyway. It was full of full colour photos and the kind of inconvenient size that makes you wish you’d waited until you were on your way out before you had bought it. This didn’t stop me feeling a tad guilty about it afterwards, and I decided from there on to scrupulously obey any more little signs I saw that had camera symbols with red lines through them. At strategic points there were guides, probably volunteer retirees, who would explain the significance of a particular room in the castle. Some of them were rather robotic in replaying their spiel, others were more spontaneous and chatty, like one bloke in the very impressive library who asked where I was from and seemed to know an awful lot about Melbourne and its trams, though he had never been there. It was to set a pattern for the whole trip actually; that there were a few people I met who had been to Australia, but hardly any had been to Melbourne. But all wanted to go back (or just go, in the case of those who hadn’t yet been) “some day”. This is, of course, what I’d always said about going to England. I think you just have to make the effort to ensure that it actually happens. After that I headed back to the car and we headed back to lunch. I took a walk that afternoon, from my grandparents’ house in Middleton, along the road towards a place called Felpham. For a village road, it was pretty busy, the stream of cars never seeming to stop. I mailed some postcards and bought a copy of The Times for later perusal, which I ended up reading from cover to cover that evening over seemingly endless cups of tea. 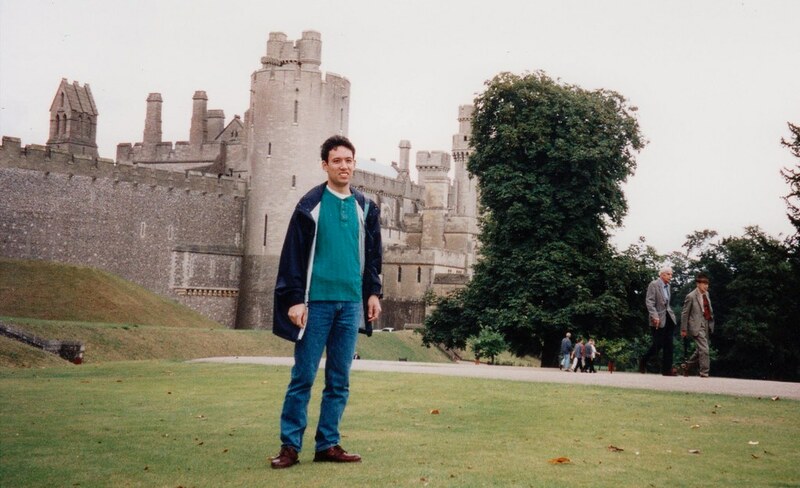 Hey Daniel, I just had a look at your archive link to September 1998 and have to tell you about when I was at Arundel castle in 2002 … You know that chapel where you insightfully stated “He doesn’t look too good”? Well, the day that I was at Arundel was a couple of days after the Earl of whatever (who lived at Arundel) had died, and the floor of that same chapel had been freshly uplifted to inter him with his long-dead ancestors. Was very interesting aspect of my visit to Arundel. Anyway, thought you might be vaguely interested, and couldn’t comment directly on such an old blog entry.